MOD has announced plans for the 70th anniversary of Victory over Japan Day. © IWM (D 25636) Civilians and service personnel in London's Piccadilly Circus celebrate the news of Allied Victory over Japan in August 1945. The Ministry of Defence, in collaboration with The Royal British Legion, will lead commemorations this summer to mark the 70th Anniversary of the Victory over Japan Day, taking place on Saturday 15 August 2015 in Central London. © IWM (D 25639) Crowds of people wait for news at the junction of Whitehall with Downing Street. The crowd consists of service personnel and civilians alike, all waiting for confirmation from the Prime Minister that the war in Japan is over. Personnel from all three Services will provide ceremonial support to the commemorations, known as “VJ Day 70”, and will assist veterans of the Far East campaign, former Prisoners of War and civilian internees and their families as they mark this historic anniversary commemorating the end of the war in the Pacific. The anniversary aims to pay tribute to all those who served in the Armed Forces, including veterans from Britain’s then Empire and beyond, who helped secure victory. Prisoners of War and civilian internees from the conflict will also be recognised. Events on 15 August will begin with a special commemoration on Horse Guards Parade, attended by senior political and military representatives, veterans and their families, which will include at its heart a traditional Drumhead Service. Following the event, current members of the Armed Forces will lead veterans and their families in a VJ Parade down Whitehall, past the Cenotaph, and the statue of Field Marshal Lord Slim, who famously led the 14th Army, and synonymous with the Second World War in the Far East. After the parade veterans and their families will be hosted at a 70th anniversary reception. 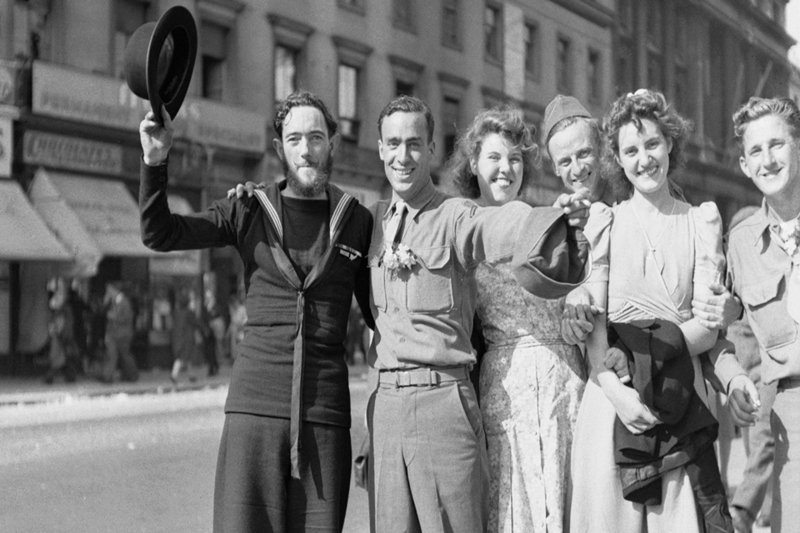 © IWM (D 25640) A New Zealand sailor raises his bowler hat in the sunshine after hearing of the Victory in Japan with several American soldiers and English civilian women on the Strand in London. 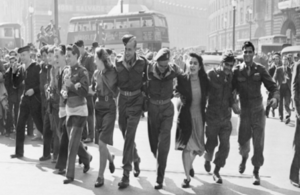 Earlier in the day, a special VJ Day 70 service will be held at St Martin-in-the-Fields, Trafalgar Square organised by a federation of organisations representing Far East Prisoners of War, their widows and families. 70 years on from the final victory of Allied Forces, the debt of gratitude that we owe those who delivered it is greater than ever. This important anniversary will be an occasion for us to repay that debt once again – to the Veterans of the campaign, to all those who lost their lives, and to the many military Prisoners of War and civilian internees who suffered in captivity. The Ministry of Defence is working closely with partners across Government and with external agencies to deliver a fitting day of commemorations to mark the anniversary, enabling all veterans – military or civilian – and their families the opportunity to participate in the commemorative events taking place in London. These include the Burma Star Association, named after the decoration many VJ Day veterans hold, and the National FEPOW (Far East Prisoners of War) Fellowship Welfare Remembrance Association. Funding support is available to enable veterans and their guests to attend the commemorations. VJ Day is important to us in the Burma Star Association and on 15 August the Government is holding a 70th anniversary memorial event in London. I know the numbers of veterans are thinning but we urge the public to try and come, and participate in memory of those who fell both during the campaign and subsequently. 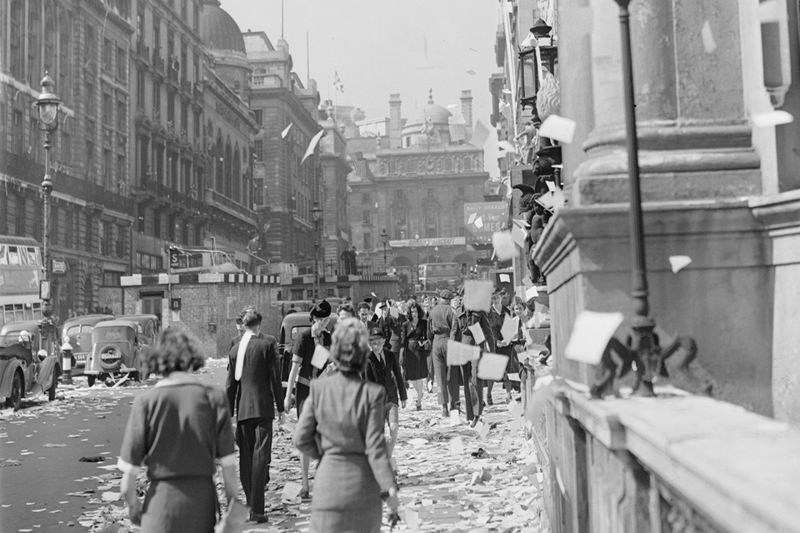 © IWM (D 25638) Civilians walk amongst the piles of torn up paper which have been thrown, 'ticker tape'-style, from the windows of offices, on Lower Regent Street, London, to celebrate the signing of the Peace with Japan. The Royal British Legion is honoured to be involved with the organisation of national events to mark the 70th Anniversary of Victory over Japan on the 15th August 2015. Over the years, veterans who served in the Far East after Victory in Europe was announced three months earlier have expressed that they often felt overlooked or forgotten. While people were celebrating at home and returning to normal lives, those fighting in the Far East were still at war. These 70th anniversary commemorations are an opportunity for the nation to show their gratitude to these “forgotten” veterans, and acknowledge the endurance and determination they showed in continuing the fight in the most challenging of environments to bring the Second World War to an ultimate end. 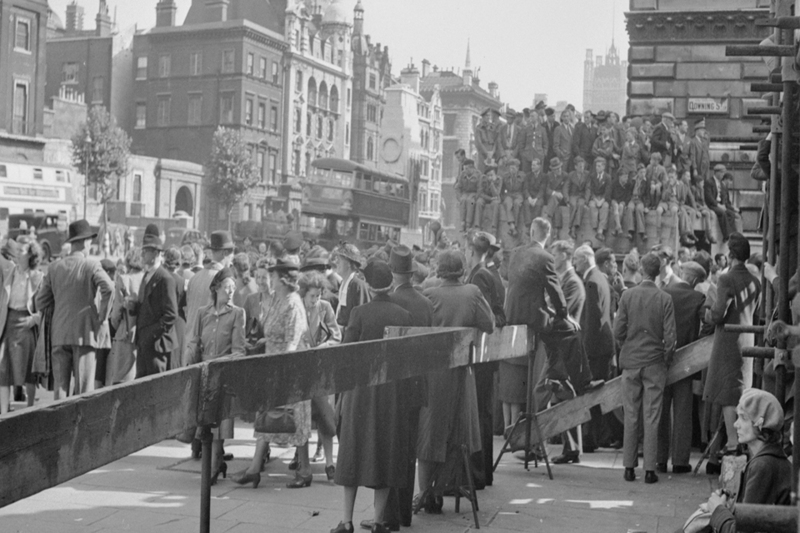 More information about how you can register to attend the events taking place in London for VJ Day 70 can be found here.